Paula Adleman, with Jeff Rosenfeld, Ph.D.
Israel is no amateur when it comes to creating new and revolutionary products. 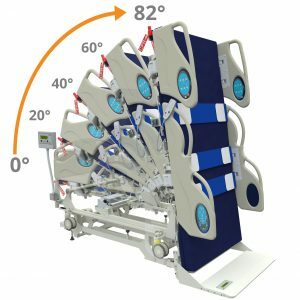 This powerhouse, nicknamed The Start-Up Nation, is now at the forefront of “The Business of Aging.” VitalGo’s Total Lift Bed, developed by Israel’s Ohad Paz and Ofer Parezky, is one of the examples of this kind of revolutionary product. VitalGo’s remarkable bed has already made life safer and easier for older people in Israel and many countries around the world. 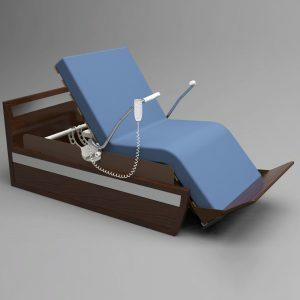 The Total Lift Bed (TLB) has a unique, “…upright tilting functionality” (UHS, 2015:1), which helps patients sit up, stand and start moving away from the safety of the patient’s bed. This makes it a very therapeutic bed, thus making the TLB more than just a comfortable place to sleep. Click here to see a demonstration of Total Lift Bed. One hospital in the US tested how the TLB worked for their patients. They found that patients who were tilted up several times per day improved more in a shorter period of time, and more of them were able to go home than patients who were confined to bed and had traditional therapy (UHS, 2015:1). TLB’s unique functionality minimizes the risk of falling out of bed, and helps contribute to shorter hospital stays. The Total Lift Bed is FDA registered and is used in Israel, USA, Germany, Austria, U.K, Switzerland, Italy, France, Australia and Norway. Some hospitals in the US include: The Cleveland Clinic, John Hopkins, Stanford University Hospital, Carolinas Specialty Hospital, Florida Memorial and various Veteran Affairs (VA) hospitals. Seniors, whether in hospital or in their own homes, and regardless of whether they are in good health or not, have a higher risk of falling and becoming less mobile. Immobility then increases the risk of many health conditions and furthers the risk of falling and decline in quality of life. The use of the bed decreases this risk. Many of the patients who have used the TLB have reported that, “This bed undoubtedly saved my life!” The hospital where the study was done found that the TLB “…improved patient-outcomes, the cost-effectiveness of providing care, and the satisfaction of patients and their families.” (UHS, 2015:1). Israel’s demographics make it an ideal marketplace for TLB. In July of 2016, The Jerusalem Post estimated that 10.6 percent of Israel’s population, or 866,000 people, are now over 65. According to a recent UN publication: “For most nations, regardless of their geographic location or developmental stage, the 80 or over age group is growing faster than any other segment of the population.” Global aging has thus created an international marketplace for the TLB in the world’s hospitals, rehab centers, and personal residences for people who wish to “age in place” in their own homes. VitalGo’s marketing efforts are responsive to the fact that there is already a worldwide need for the TLB, both in hospitals and at home. Many seniors prefer to age-in-place (at home) whenever possible. Safety concerns, aging minds and decreased strength and mobility, along with increased risk of falling (especially getting up out of bed where many falls occur) can make aging in place challenging or unsafe. The chances of falling out of a bed, a chair, or down a flight of stairs increases with age, even for the healthiest of seniors. One of the key goals in the development of the Total Lift Bed has been to help Seniors age in place with safety and dignity. At home, or in the hospital, the TLB does most of the lifting that caregivers (whether they be trained professionals or loved ones) would ordinarily give. The TLB does not replace the human touch, but rather, enhances the ability of the caregiver to provide the healing touches needed, without the heavy lifting that leads to caregiver burnout and risk of injury. Additionally, being able to be raised smoothly and effortlessly enhances the quality of the mobility experience, without having to worry about hurting their nurse or loved one who is helping them to get up and move. With the push of a button, whether at home or in the hospital, TLB contributes to mobility and self-confidence. 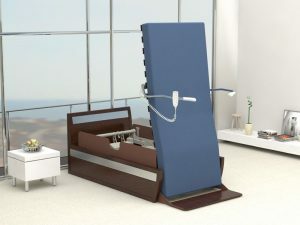 Hence, individuals, patients and caregivers (whether professionals or loved ones) are beneficiaries of the Total Lift Bed. For more information about the Total Lift Bed, see the Vital Go site. Biosketch: Paula Adelman has an eclectic background and divided her time working in sports, raising 2 wonderful sons and helping the aging population. She has a business degree, with an emphasis on entrepreneurship. She divides her time between the US and Israel. Paula is the founder of BoomerSurf.com, an American/Israeli based tech start-up. Through BoomerSurf, she is helping Boomers and Seniors manage computer, tablet and smartphone tasks online and through It improve their connection to family, friends and community. For more information visit: BoomerSurf.com.